Another simple recipe to add to your home apothecary. This one is almost as old as time, and combines garlic (poor man’s penicillin!) with Manuka honey for double the antimicrobial punch. When I was a wee one, I vividly remember my Dida (grandad) crushing whole garlic cloves, resting them on a spoonful of honey and throwing them down the hatch. I used to wrinkle my nose in disgust! He always had garlic-smelling fingers and of course a garlic-breath to boot. 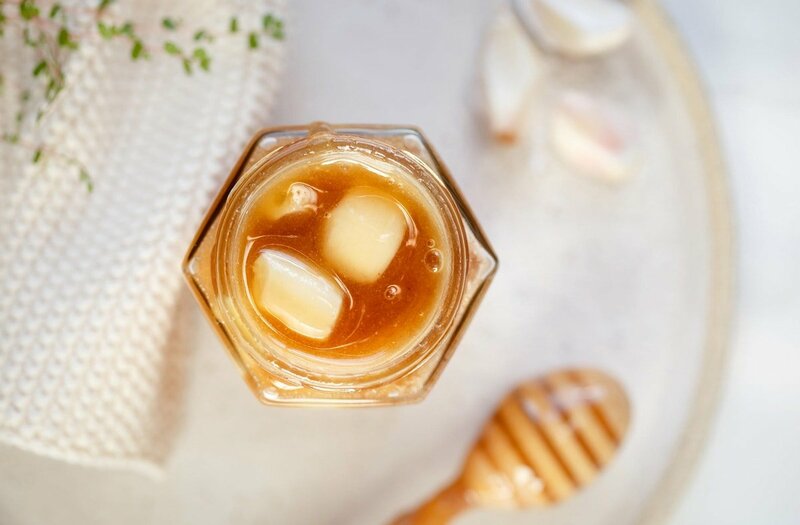 It turns out, the old garlic and honey combo is as old as the hills, a centuries old remedy for sore throats and colds. We know that the active anti-microbial and anti-fungal compound in garlic is allicin,and an extremely delicate one at that – it oxidises very quickly. Allicin is responsible for the strong pungency we associate with garlic. There is not much in the way of literature to support the therapeutic benefits of garlic honey itself, however I did stumble across one study that found the two had synergistic antibacterial activity against a range of pathogenic bacteria such as Salmonella, Staphylococcus aureus and Streptococcus pneumonia (the bug responsible for pneumonia, bronchitis, and ear infections) . I imagine that the fermentation process unlocks nutrients and beneficial compounds as it matures. I’ve mentioned this a few times here on the blog, but choosing a quality (and kind) honey is truly important. From a medicinal standpoint, you want to seek out a raw Manuka honey – anything heated will have damaged the valuable antimicrobial properties (this is also why you add it to warm, not hot water when making lemon, honey and ginger drinks). Additionally, raw honey will ensure we have plenty of wild yeasts available for fermentation. 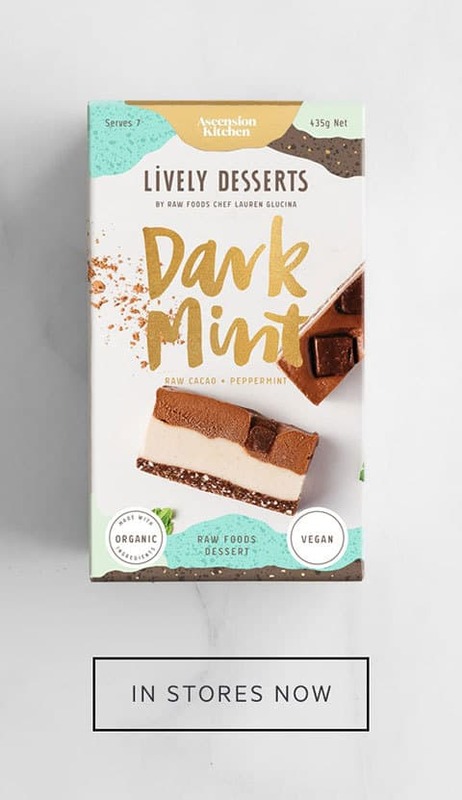 From both a compassionate and environmental standpoint, find out whether the producers have fed their bees sugar-water or not. Bees are typically given this over the winter months to sustain them because their honey has been over-harvested, leaving them nothing left for their own survival. Sugar-water (as in, refined white sugar) is a far cry from honey, and not surprisingly, wrecks havoc with their immune systems, leaving them susceptible to disease. This is one of the main culprits behind colony collapse disorder (along with exposure to toxic sprays and pesticides). If you’re in New Zealand – I recommend Beagle’s Bees. I mean, we don’t really need to go into detail here because it so simple – just make sure you use a glass honey jar, and pack it full of bruised cloves, leaving an inch or so at the top. Firstly, you’ll see that the honey starts to liquify and become extremely fluid and runny as it starts to ferment. You will also notice the garlic cloves will float up to the top of the jar. Bubbles should start forming after a day or two (a positive sign of fermentation!). It does seem to mellow out in taste during the fermentation process, so it’s much more pleasant to get down once aged. 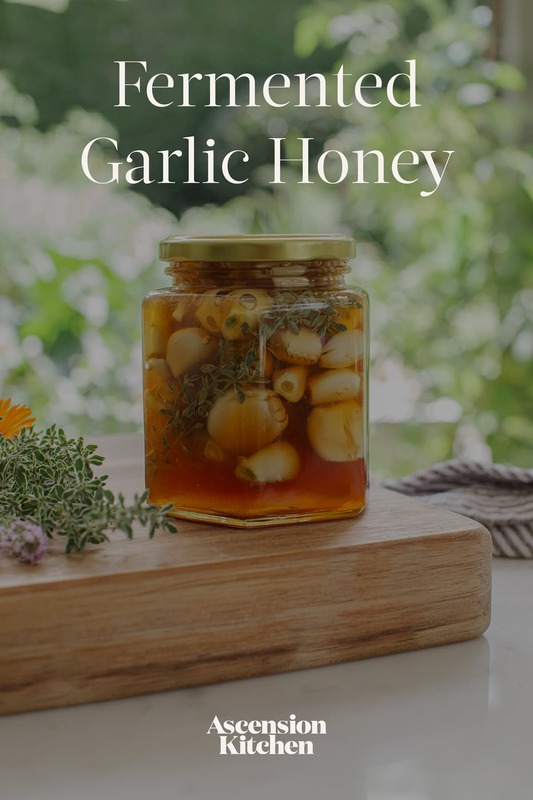 3-4 weeks is a good length of time to ferment your garlic honey, but you can dip in and enjoy whenever you like really. Store it airtight out of direct sun and it will last you all winter. Just like the oldies did back in the day! A teaspoon with a whole clove or two taken daily over winter to keep your immune system robust and the dreaded large at bay. Finally – if you’re after a sweet little honey dipper – these are great. If you’d like to chat with me about essential oils, or book in a 101 class, you can do that here. 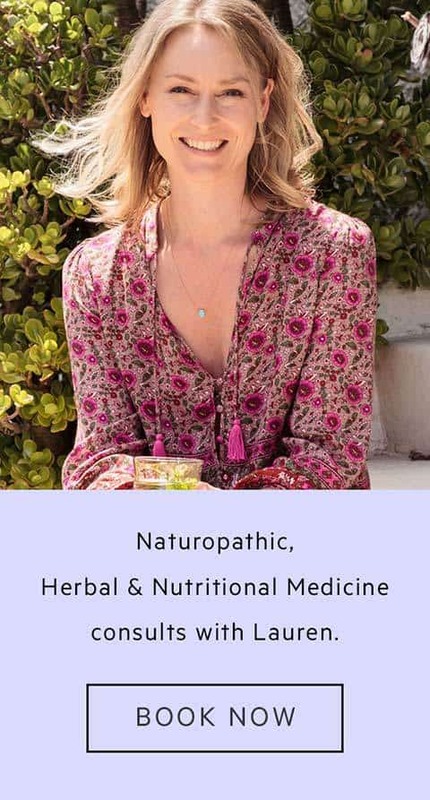 If you’re after a Naturopathic consult, read more here. As an Amazon Associate I earn from qualifying purchases. I only recommend products I use and love – thank’s for your support! 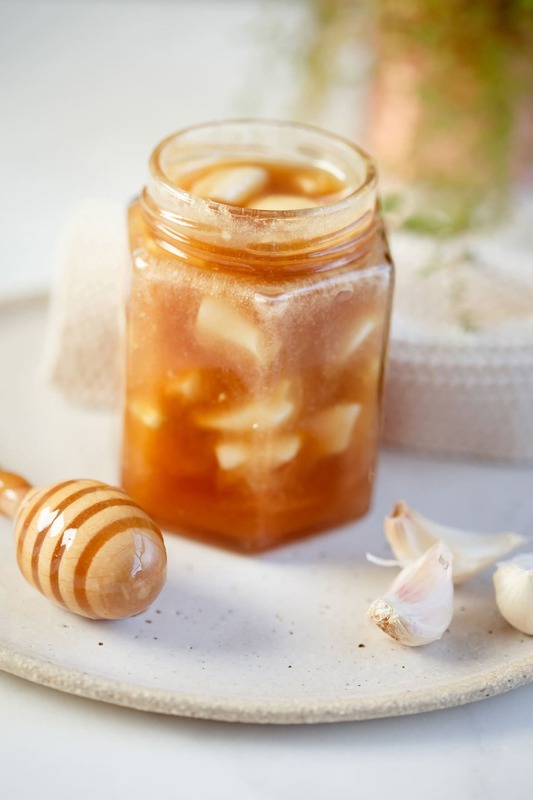 Fermented garlic honey - an age old immune tonic to fight winter ailments! Prep time excludes the 3-4 weeks fermentation time. Purchase a good quality Manuka honey in a glass jar, then let stand in a bath of warm water till it is soft enough to pour. Pour the honey out into a sterilised jug and set aside. Peel ample garlic cloves, and gently bruise or crush each one. Add to the jar, leaving about an inch or two at the top. Pour the honey over the garlic, until completely covered - you want to avoid the garlic being exposed to oxygen. Save any leftover honey for later use. Fasten the lid and let infuse for at least three weeks. Enjoy a teaspoon/clove of fermented garlic honey daily.